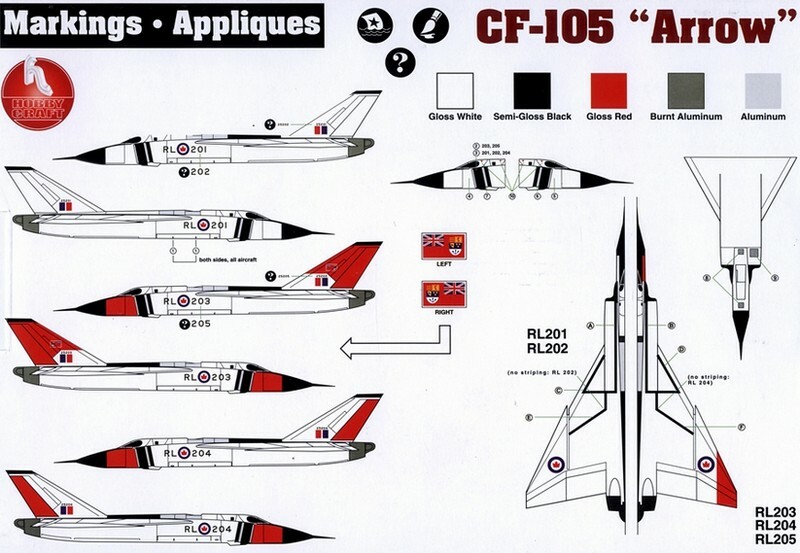 The Arrow (CF-105) was designed as an advanced, supersonic, twin-engined, all-weather interceptor jet aircraft. It was developed in Canada by A.V. Roe of Canada starting in 1949. During the Cold War the soviets had introduced new long range bombers, that were capable of flying over the North Pole to attack North America. The Arrow was to reach very high double MACH speeds over the large distances to intercept Soviet bombers. 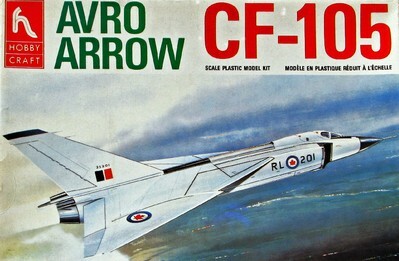 Arrow design started beginning 1950 and the first flight was March 25 1958. It had many technical innovations but costs were rising. 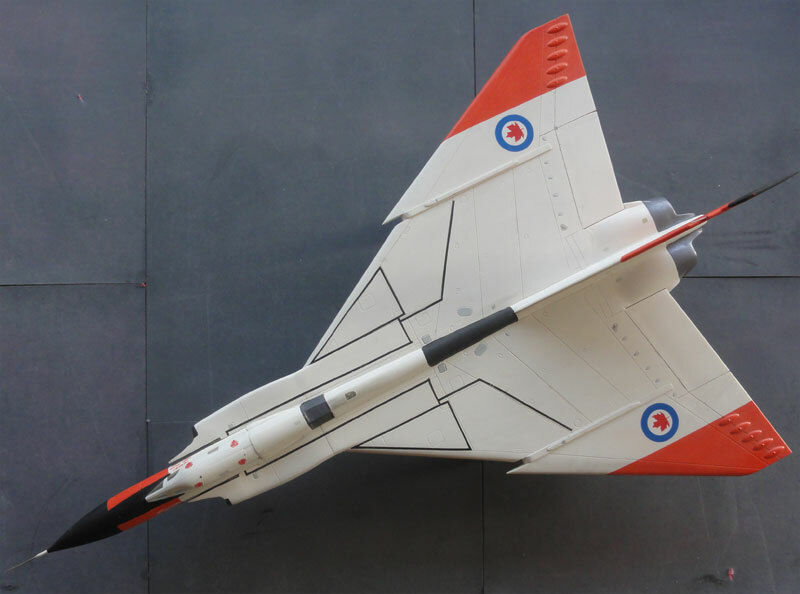 The program was cancelled by the Conservative government February 1959, less then 3 weeks before the Arrow mk.2 was to take flight. 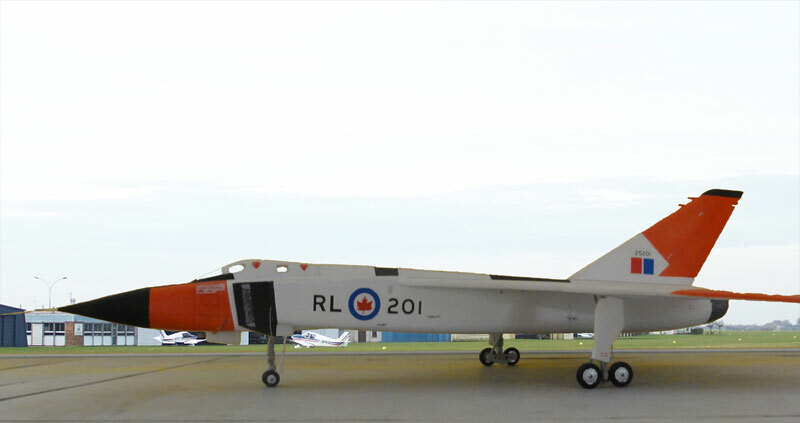 The prototypes and Iroquois jet engine were scrapped and it remained a top secret affair what the Arrow was capable of. 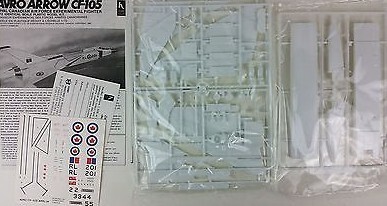 Hobbycraft Canada released decades ago in the nineteen-eighties a rather basic 1/72 scale kit HC1392. 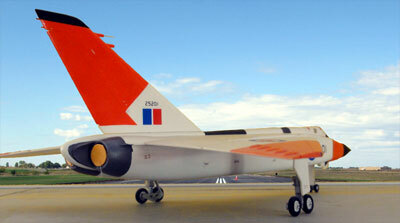 It was also not very accurate, with strange fairings on top at the ailerons. I made the kit at that time straight out of the box in the 1980s and I did not have a lot of information. There was no internet! NOTE: Later I saw that the kit (box HC1393) as improved with another fuselage, the fairings were not at the lower wing, a better shaped canopy and better details like the undercarriage and exhaust. The parts were in white plastic, not too many of them in the box. The gear bays are also not deep. The model was airbrushed overall gloss white. After masking, the various orange panels were airbrushed, I remember using "graphical" masking tape used for electronics etching for the first time. It worked great and also the black panels were masked. ( many years later, better masking tapes became available). I also remember that the Hobbycraft decals were very flimsy, but I managed to get them onto the model. As you see now, the decal roundel colours are also not accurate. The exhaust and intake are shallow, so I added "covers" made from thin card. But still, it is a nice model on the model shelves.